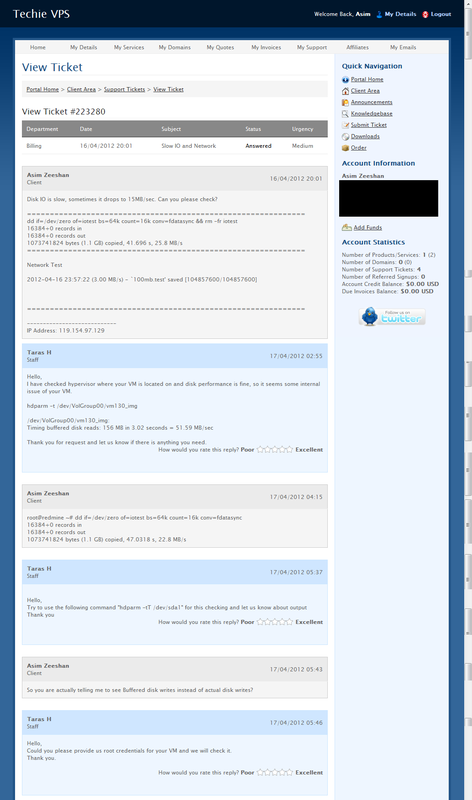 Yes, its the same UK2 Group which also owns VPS.NET, ThurstVPS.com etc. At first the test results were very good and tempting but I wanted to see how well it goes before putting something serious on it. Contacted support and got this in return so … this may not get fixed anytime soon. I was hoping to be suggested to transfer to another node or something. Yes, I have cancelled my VPS effective immediately because I just cannot drag a VPS that I may not use. Rus Foster was nice enough to handle the request for me to refund the future invoice that I already paid in advance (due 24th April, paid 10th April). hdparm -tT (note he requested both t and T) actually tests both buffered and unbuffered speeds. But still this is reads and not writes. On a side note, I find that a good and consistent ioping is much more relevant to a VPS performance than dd. I have seen some with 20-30 MB/sec, but if ioping flats at 0.5 msec, this is nothing to worry about.